Explore a wooded oasis that was once a dairy farm. This reclaimed natural area has a short loop trail with views of a wooded ravine. 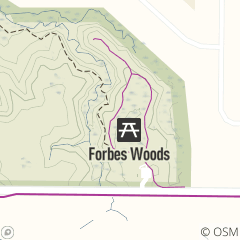 In 2016, a connector trail was added from Forbes Woods to Hawthorn Parkway that cuts through the ravine and has several boardwalks to aid in crossing over the wetlands.